Most Star Wars fans have already combed through every shred of special features available on Star Wars: The Force Awakens Bluray by now, but believe it or not, the film actually just wrapped up its theatrical run not too long ago. After a record breaking release in December, The Force Awakens just kept raking in the money for Disney week after week and only recently left its final theater. Now we can finally see how the film stacked up at the box office. According to Box Office Mojo, this sci-fi sequel spent a total of 168 days in theaters and made a whole lot of money in that time. Worldwide, the film made $2,068,176,052, which is going to put it at the number 3 spot on the all time box office chart, behind the two James Cameron juggernauts Titanic and Avatar. 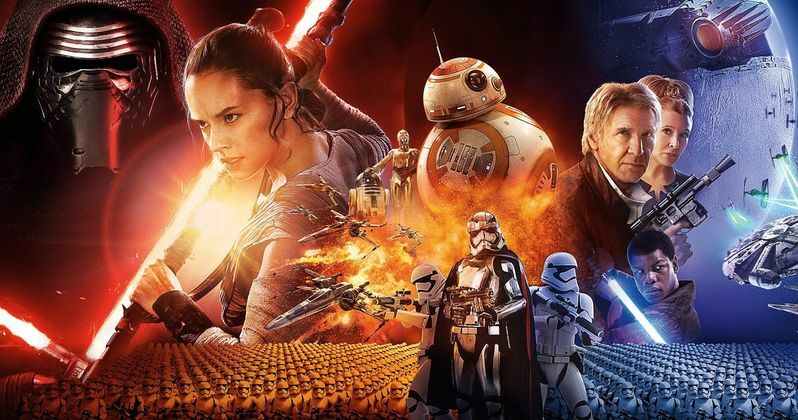 The Force Awakens is also only the third film in history to ever make more than $2 billion worldwide, the next closest being Jurassic World with $1.67 billion, which isn't even really that close. Many had predicted that J.J. Abrams' entry in the Star Wars franchise had a great chance of overtaking Avatar for the all time top spot, but it ultimately didn't even get close as Cameron's sci-fi epic made a staggering $2.788 billion, which at this point seems out of reach for pretty much any film if Star Wars couldn't do it. Granted, the landscape of blockbuster filmmaking has changed a lot since Avatar came out in 2009 and it would be very hard to replicate those circumstances for any other film moving forward. Disney will get to take a massive record to the bank though, as The Force Awakens is far and away the highest grossing movie of all time domestically, besting both Avatar and Titanic by a very wide margin. The Force Awakens took in a staggering $936,662,225 domestically, which is nearly $200 million more than Avatar's $760 million. The drop off from there is pretty steep, with both Titanic and Jurassic World topping out around $650 million worldwide. When adjusted for inflation, The Force Awakens falls to number 11 on the all time domestic chart, with the original Star Wars coming in at number 2 behind only Gone With The Wind. Though some of the focus will be on how Disney's first new Star Wars movie didn't become the highest grossing film of all time as some expected it could, it is by no means a disappointment. In the long run, faith in the franchise has been restored and the success of The Force Awakens have created massive opportunities for revenue from merchandise, theme parks and everything in between. So, even though Avatar may have made more money, you don't see a whole lot of Avatar merch at Wal-Mart these days, but people will probably be buying Kylo Ren shirts until long after we're gone. Disney has much larger plans for the Star Wars franchise, and The Force Awakens was just the first part of it. Rogue One: A Star Wars Story will be released this December and will be the first non-episodic Star Wars film ever, with others such as a Young Han Solo movie already in development for a 2018 release. Next year, fans can of course look forward to Star Wars Episode VIII, which is being directed by Rian Johnson and is currently filming.